I have always believed that it is the relationships which provide energy and strength to carry on with life positively. It is through relationships that we get to learn the nuances of leading life successfully and in full king size. Friendship is one such relationship and since it involves the choice rather than imposition one has to be cautious while choosing friends and committed while maintaining friendships. This is the basic rule that I have been following. 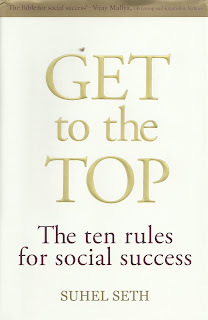 Having watched Suhel Seth on TV and read him through his columns, when I came to know about this title called 'Get to the top', I decided then and there to get a copy and go through it to further explore on the art of maintaining relationships. This book is divided in four parts which cover 10 chapters, 4 appendixes apart from acknowledgement section. Relationships are mutual and could be initiated by either party. At times we look at a person and get attracted to talk to and at times people get attracted to us. 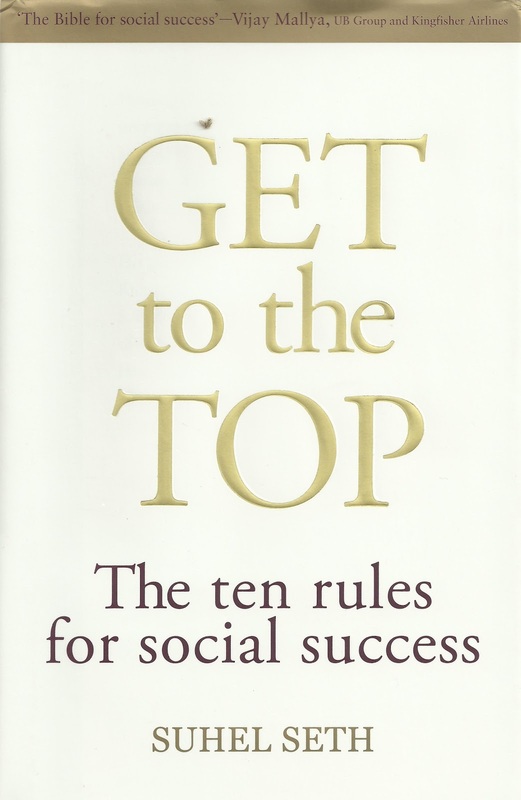 The book provides the keys for attracting the attention so that people keep looking forward for meeting you or listening to you or sharing some time with you, he provides two rules for that, viz., the self-development rule and the impact rule. Similarly the book prescribes many rules and guides the reader to follow some practices which always help to maintain long lasting relationships. The book is full of anecdotes and examples from the personal life of Suhel and after going through the book one would certainly develop an admiration of the author as he is able to balance his relationships between two persons of totally different ideology. This is an impressible art. And in a very suggestive form this book helps one to that call of balancing act. Respect for friends and selfless commitment is a virtue and it is really a very difficult act, though not impossible. His relationships with his friends like Russi Mody (though at a time his boss), Vijay Mallya, Kapil Sibal, Arun Jaitley, Barkha Dutt, etc. (a complete list of friends is given at the end of the book who taught him the secret of learning how to get to the top), as narrated and illustrated through the events makes the book rich in its delivery and content as well as relevant and convincing to the reader. The most important advice I liked was the uprightness and consistency in one’s behavior and I too strongly feel that it might result in some short term losses but at the end one is sure of being admired by the affected parties. So a great lesson and practice which keeps one as an honest, concerned and committed relation maintainer. He chants some mantra’s like: having opinion is the key to getting noticed, people need to be like sanitary napkins – absorb all opinions but not colour the issues, think like a debater – respect the other side of your argument, delivery is key – opinions should make you friends not enemies, invite people to your home who will laugh and be happy irrespective of material considerations like which car they drive or what clothes they wear. In total the book is packaged very nicely and it really does not take much time to get through the end of the book. I personally enjoyed reading it for a change.